I'm sorry that you're feeling neglected these days, but I certainly understand why. Believe me, I'd like nothing better than to be able to stop cheating on you with that other blog and return to our nearly-weekly rendezvous. That other blog? No, it’s definitely no fun, but, alas, I can't give it up just yet. Hopefully soon—very soon—my mom will be well enough and I’ll be able to ditch it. 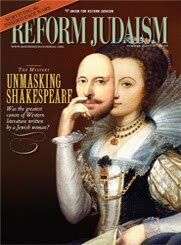 In the meantime, though, check out this article in the new issue of Reform Judaism magazine. No, I'm not cheating on you there, too...just using it as a venue for a slightly different type of writing. Again, I’m sorry that we haven’t been able to spend much time together lately. Looking forward to a positive change of circumstances and to getting back together with you soon. Take care of yourself.